Ahhh!!!! It's almost 2018!! 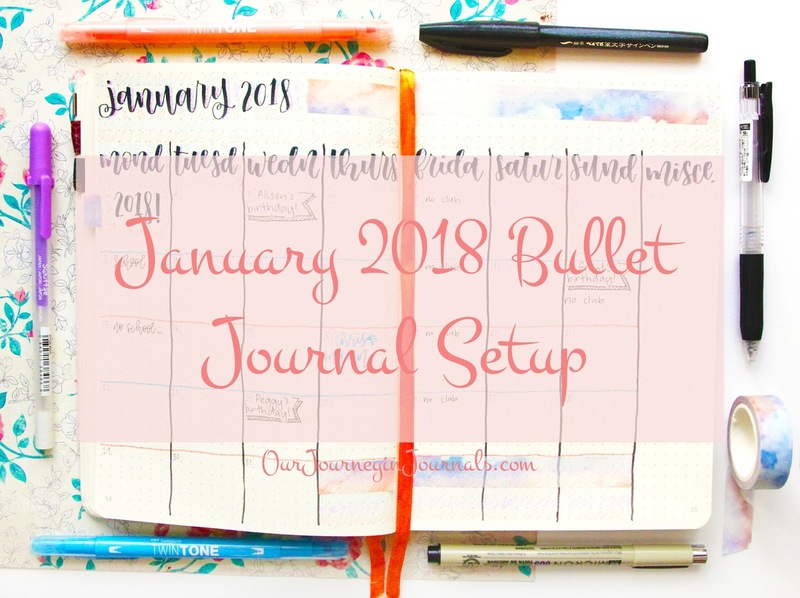 For me personally, I'm not starting a new bullet journal for the New Year for reasons I discussed in a blog post on whether or not you should do the same. 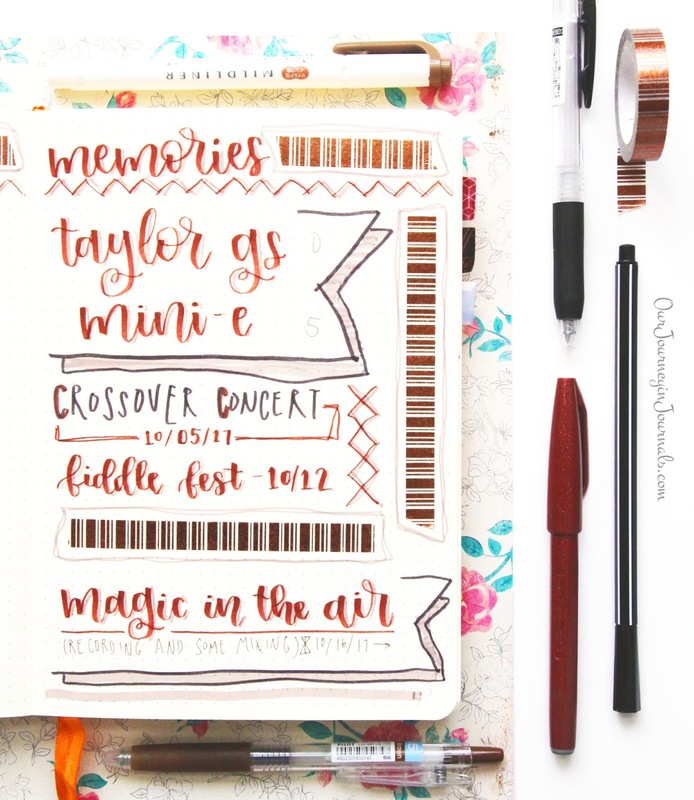 So, my bujo setup for this month is actually fairly similar to my normal setups. First of all, here is my completed December monthly spread (if you want to see how it looked like at the beginning of the month, then check out my setup post from last month). Anyway, without any further ado, here is my setup for January and for 2018! This is my 2018 year-at-a-glance. I find it way too tedious to plan out and subsequently draw my own yearly calendar, so I am using this pretty printable from Wendaful. 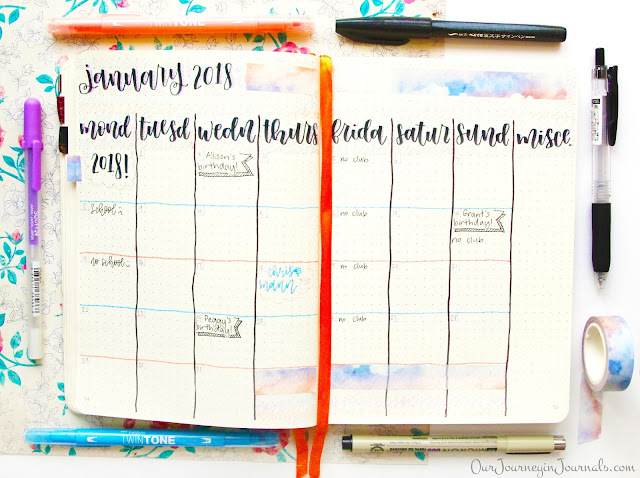 I've been using her printable year-at-a-glance calendars ever since I started bullet journaling, and I find that it's nice that she provides both Monday and Sunday starts and printables at different sizes--all for free. I printed the Monday start version in the A5 size, which fits well in my A5 Rhodia Goalbook. This is my January monthly spread. I had trouble picking out my color scheme, since really the only colors I associate with the month are blue and silver--which were already the colors I used for my January setup from 2017. So, seeing this particular roll of washi tape among my much-too-large collection, I decided to use that as the basis of my color scheme and find pens that matched it. I ended up using a black Pentel Fude Touch Sign Pen, two Tombow Twintone markers (a pink-y peach and one of the blues), and a purple Sakura Souffle Gel Pen. However, though these pastel, cotton candy colors don't really up well on camera, especially the details that are on the sides of the downstrokes, I really like how it looks in real life. This is my blank monthly memories spread for January. 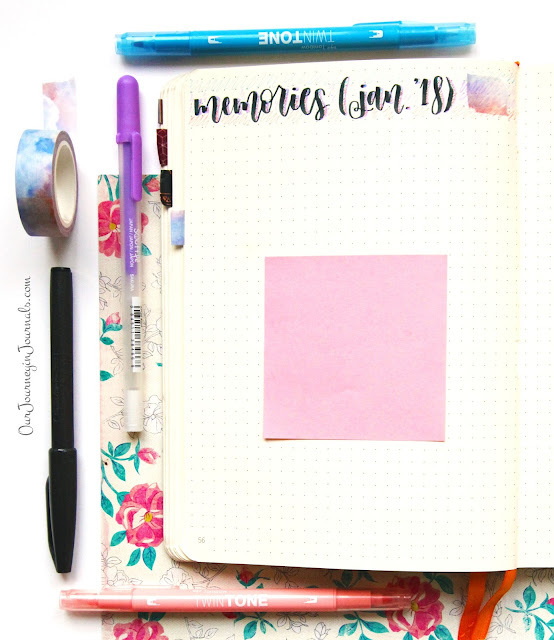 In a nutshell, I do a memories spread in my bullet journal each month to record the big things that happen each month. If you want a more in depth explanation, check out this blog post. As an example, here's my filled out monthly memories spread from October. I try to show my completed memories spreads in my setup posts (once I actually do them, at least), but y'all don't get to see my November one because it does not look good at all haha. Also, since December isn't over yet, I don't have that monthly memories spread done yet. So, that's really it for my bullet journal setup this month! I might do a 2018 resolutions page, but I still haven't decided yet. 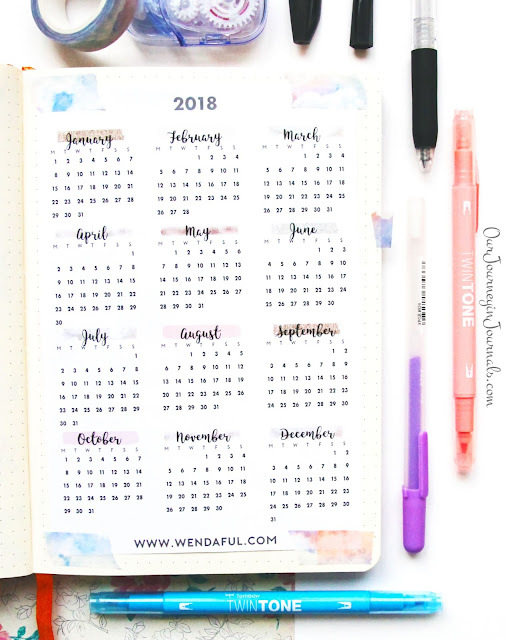 Also, I still need to make a blog post editorial calendar that'll stretch--I think--from January 2018 to June 2018; I have the pages set aside in my bullet journal to set this up, but I haven't actually filled it out yet. 2017 was kind of a crap show of a year for the world as a whole, and as for my own personal life, I had some really awesome things happen and some really awful things happen. However, let's focus on the positive; what's one thing (or multiple things) that you're grateful for from this year? For me, I'm really happy that I was able to reignite my love for theatre and songwriting/music making!